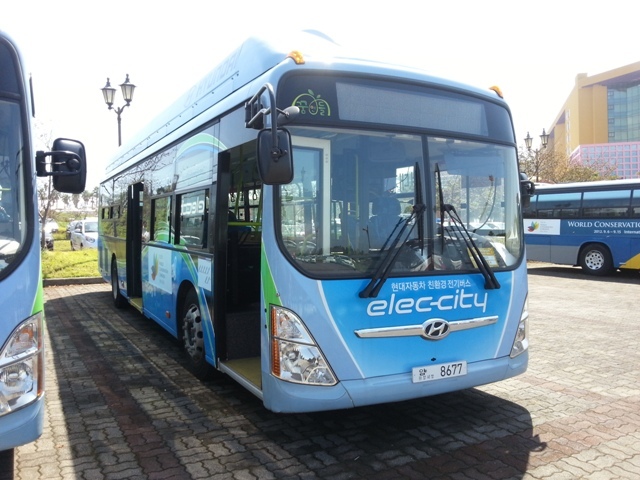 Seogwipo to launch electric vehicle tour busThe tour bus is part of a tourism revamp aimed at creating a "high-class tourism city"
Seogwipo city is launching the island’s first EV tour bus in May. The “EV Bus City Tour” will stop at the Seogwipo Five-Day Market, the Maeil (Everyday) Market, Arangjoeul Food Street, Jeju Olle Tourist Center, Lee Jung-seob Art Street, Cheonjiyeon Falls, Jaguri Park, Seobok Gallery and Jeongbang Falls. The city hopes the bus will help boost public awareness of EVs, resolve parking issues, and improve tourist services. The scheme is part of a 6.35 billion won investment in the tourism sector to create a “high-class tourism city” for both tourists and residents. A total of nine projects will be supported including investing in local Olle Trails. A city-wide competition will be held for ideas on how to use open space adjacent to the Olle Trails for locals to sell local produce and goods. Additional cultural programs will also be held at Gangjeong Port to welcome the over 180 cruise ships that are due to start arriving in July. A city spokesperson said that the new programmes are “enthused with Seogwipo-ness” and embody the “cleanliness and coexistence of the Jeju Future Vision Plan” being implemented by the province. This news has been brought to you courtesy of Arirang Radio. Listen to the latest Jeju news on Wonders of Jeju with Joseph Kim (every night / 10pm-12am). You can also hear Jeju news onGood Morning Seoul every weekday morning at 8am.